Automatic Rising Bollards - Truro, Cornwall. 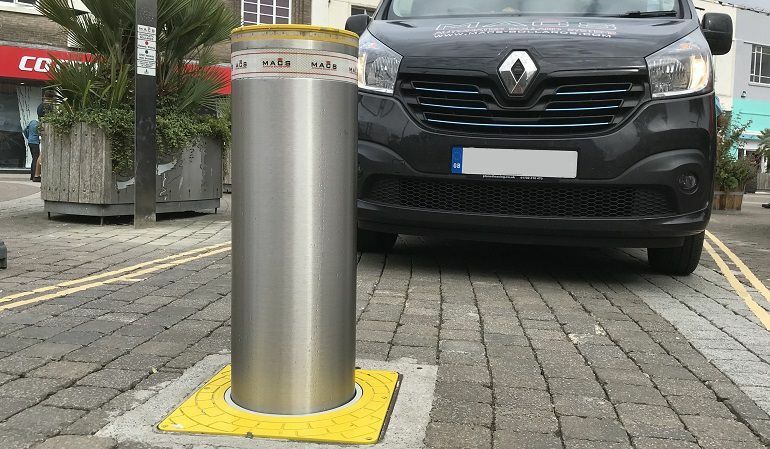 Macs are delighted to have recently completed the installation of a new automatic telescopic bollard system in Truro, Cornwall. Implemented to control the traffic flow through a town centre bus gate, the rising bollards work in conjunction with a vehicle transponder reader system, allowing access through the system only to authorised vehicles. The bollards also incorporate our latest remote access PLC based bollard control and monitoring, allowing for remote access and control of the bollard system 24 hours a day. Located at the entry and exit to the bus gate at Back Quay in central Truro, the PASS 275/800 bollards are specifically designed and built for use in traffic management applications. Having supplied numerous bollard systems within Cornwall for over 10 years, this is another successful installation in partnership with Cornwall County Council and SSE Contracting Ltd, and the bollards have again been installed to meet Highways England standards. To find out more about how our products and services could be of use, take a look at our full range of PASS telescopic bollards and remote bollard monitoring solutions. If you would prefer to speak with us direct, please call us today on 0161 3206462, and we'd be delighted to assist with your enquiry.